Whenever I move to a new area, I always look forward to discovering how different communities mark and celebrate the seasons of the year. During November and December, we travel through significant times and seasons. As I write this letter, the darker nights are setting in and the autumn colours are fading, a sign for me that this hectic year is drawing to a close. But it is also a sign that the season of Advent with all its hope and promise, is not far away. The season of looking forward to the coming of Jesus past, present and future is nearly here. Recently, I have been hearing how various places are marking the season of Remembrance that November highlights for us. My paternal grandfather served in the First World War and occasionally he would tell us tales of his experience – of the fears and of the comradeship he lived through as a young man. We can never forget the sacrifice and cost to life of those who have laboured for freedom and peace in years past and present. Our services of Remembrance seem to have found a fresh resonance in recent times. Also, this season helps us in a wider sense to reflect and give thanks for those who have shaped our lives by their good example and selfless acts of kindness and ‘for all the saints who from their labours rest’. Advent falls at the beginning of December and what an exciting time it heralds. The adventure of the journey to the stable at Bethlehem starts to unfold culminating in the amazing news of the birth of the baby boy who is Saviour and King. It is a special season and I hope you can find ways of marking the joy and wonder it brings to young and old alike. There will be plenty of opportunities to get involved in church and community events as anticipation grows and celebrations are marked. Look out for the details of Advent and Christmas events and services and come along to share in the fun and friendship and deep meaning of this season of promise. Yea, Lord we greet thee, born this happy morning; Jesus to thee be glory given: Word of the Father, now in flesh appearing: O come, let us adore Him, Christ the Lord! It may seem too early to do so, but I wish you a joyful and peaceful Christmas. We continue to pray for Ron and Doreen Forth. Doreen has been back in hospital and Ron is living in residential care again at Churchill House. We pray for Shannon Gray, recovering from surgery, and Lois Thomas, Brian Hampshire, Zem Rodaway, Barbara and Dave Whelan. We pray for those who are unable to come to worship due to ill health or mobility problems, remembering Jean Clark, Vanessa Hughes, Brenda Robson and Christine Clark; Those living permanently in residential homes, especially Vera Hutchings and Ian Hodgson; Alan Bays and Connor McKervey, both undergoing treatment. John Girling, Brian Turner, Pauline Cassanell and Gwen Turner and pray for Rosemary Girling, Rita Turner and the families of Pauline and Gwen at this difficult time. WE PRAY FOR – Lesley and Darren who were married at Sutton Methodist Church on October 14th. Our minister and Circuit Superintendent, Debbie Lucas. The theme of this service will be The Shoe Box Appeal. Donations of completed shoe boxes or separate items for a shoe box will be gratefully received. Lists of suggestions for items to be included or avoided have been circulated recently. Please talk to a steward or Deacon Sue if you have not received a list and you would like one. Reverend Colin Plenderleith has been planned to take the service at Sutton and our MORNING WORSHIP WILL START AT 10.00am. There will be a short break at 10.45 am to allow those who wish to the chance to leave in order to walk to the open air Service at Sutton War Memorial. 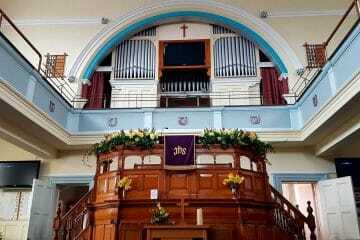 In our Church Rev Colin Plenderleith will continue his service with a short Act of Remembrance either side of 11.00am. The Christmas Fair which will be held on Saturday 18th November. If you have any items suitable to sell, please could you either leave them on the stage or contact Robin or Helen on 712814 to have them collected. We find that people are often looking for Christmas gifts so if you have anything at the back of the cupboard that you got last Christmas and haven’t used, perhaps now is a good time to pass it on. We will also be having a cake stall at this event. Once again, we would like help setting up before and selling on the day and more details will follow nearer the time. Our singers and guest instrumentalists will perform THE GIFT by Graham Kendrick. We have been rehearsing since the beginning of October and also making preparations in other ways. We are keen that we have a good congregation for this event in early Advent, so please make this the beginning of your Christmas and encourage others to come along too. The gathering will help us all to prepare ourselves spiritually for Christmas. The Morning Worship will be a Parade Service. Evening Worship will be a Circuit Advent Service at the Bilton Grange Worship Centre. Following on from a visit to the school in Advent last year, a group from Sutton will be taking part in a school assembly. Final plans are still being worked on, but the visit will probably include a short drama and some carols. 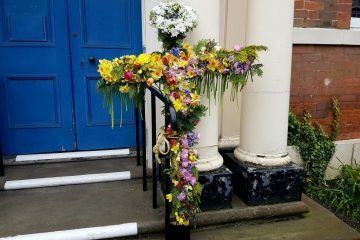 at Holderness Road Methodist Church. Also, please let us know if you have a small artificial Christmas tree (4 foot high maximum) that you are able to loan to the church for the duration of the Christmas season, or if you have spare Christmas decorations which could be useful for one of the groups or for general decoration around the church. Thank you. We will be collecting shoeboxes for Real Aid again this year and would be grateful for either made up shoeboxes or items/money to make them up ourselves. For information on items please see www.realaid.org.uk or contact Helen Siddle on 712814. These are usually collected around the middle of November so we need to try and have them ready toward the beginning of November as there will be a service about this subject on Sunday 5th November. Christmas Craft Afternoon Sunday 17th December followed by Carol Service.For any further information don’t hesitate to contact me. What a brilliant ‘Harvest Festival’ weekend we had. From the barn dance on the Saturday with its live band and delicious supper to the enthusiastic parade service on the Sunday morning was simply amazing. This year some 100 people were at the barn dance, from the Guides, who also had a sleep over in the church hall; neighbours living in close proximity to the church; friends from our sister church St. James and their minister, to others who saw it advertised on the notice board all swelling the numbers making it lively and great fun with lots of laughter. Everyone from teenagers to seniors joined in, partnering each other and making new friends they might never have met before. It was lovely to see Rev. Debbie tripping the light fantastic at her first Sutton barn dance. Sunday morning was equally as enthusiastic with harvest hymns, prayers written by some of the Cubs and a sketch by the ‘Mr. Men’ in the guise of some of the young people and leaders. And we can’t leave out the rendition of the ever popular ‘Cauliflowers fluffy’ led by Messy Church and the Uniformed Organisations. This full-on harvest service led for the first time by Rev. Debbie was very much appreciated by all who came. And it was a joy to welcome our friends from Bransholme Methodist who joined us too. Many thanks to everyone who were part of arranging both events including setting up and clearing away, and of course to our friend and Minister Debbie who didn’t really know what she was letting herself in for. Roll on 2018. Following the great evening with Roger Jones at the Acorn Centre, Bilton Grange, Jean Gray has had a letter from Roger saying how much he and the team enjoyed their visit here in Hull. He wanted to thank everyone involved in presenting and presenting the evening, and those who attended. Come and try a craft of your choice, to refresh your skills or learn something new. Meetings are from February to November every second Wednesday each month at Ings Library, and every second Thursday each month at Central Library from 10 am to 12 noon. Also at Bransholme Methodist Church every Tuesday 9.30am to 11.30 am. Details from Linda Whitton in church. Donations of knitting for the Baby Unit, and the Twiddlemuffs for patients with Dementia continue to be wanted. Every time I take bags of knitting in, the hospital, staff I hand them over to are so grateful and full of admiration of the items, and of the people who make them. I am happy to take them in to the hospital, despite the waiting time to get in! so please do keep them coming. Details of what to knit, and patterns can be supplied to anyone who wants to join our band of knitters. Also, donations of knitted or crochet or stitched tree decorations, or other imaginative hand- made decorations, wanted for a Craft tree in the Church Christmas Tree Festival. This is to showcase the wealth or talent quietly going on behind the scenes, by so many people of, or connected to people of this Church. Thank you to those of you who have taken up this challenge so far. CHURCH LIBRARY is open after the service every Sunday I am in church. Any one is welcome to borrow any of the books, just add your name and the date in the notebook, and the date it is returned. Next to the library case on the cakes table, there are books and greetings cards, and often other things for sale, all to raise money to support the church. Two recent events have made me reflect this month on two national occasions of remembrance in November – November 5th, Guy Fawkes Day, and Remembrance Sunday. The first recent event was when a plaque was placed in Westminster Abbey to “bury the hatchet” of past bitter religious conflict by recognising that both Catholic and Protestant martyrs such as Moore and Cranmer were equally Christian and right in what they stood for. Yet in contrast to this happy recognition, coupled with a mutual confession of past sin and error, we will again “remember the 5th of November” traditionally kept denigrate the memory of Guy Fawkes and his fellow conspirators who were merely reflecting the same bitter religious and political conflict the Westminster ceremony was seeking to put to rest. So, although the historical reason for it is scarcely remembered, and apart from the fireworks argument, I think that November 5th should be completely scrapped and ignored altogether. If we want our firework displays let’s have them on some other occasion to celebrate something worthwhile! The other recent event was the Nobel Peace Prize award to the N. Ireland Peace Movement Leaders. Last Sunday I watched a T.V. programme about the movement. This reminded me how these women, and other active supporters, are ready to risk their lives daily in their opposition to the people of violence. It reminded me also that any real peace and victory over evil can only be won at a high price of courage, faith and sacrifice. Apart from any personal remembrance people have of loved ones lost in the past world wars, Remembrance Sunday is well worth keeping in so far as, nationally, we are reminded of the above facts. The measure of peace most of us enjoy should not be taken for granted and we should acknowledge that the things which make for war such as injustice, poverty, superiority and pride, extremism and intolerance, are still very much with us in the world today and we who claim to be Christians should recognise them and work very seriously to help destroy and overcome them. I am writing this letter whilst the front page news is all about President Sadat’s visit to Israel. His historic speech in the Israeli Knesset had a strong religious tone. The day coincided with the festival commemorating the willingness of Abraham to sacrifice his son, Isaac, (Gen. 22) and specific and appropriate reference was made in the speech. Listening to the T.V. recording, I was impressed by the religious sincerity of both the Muslim and the Jewish leaders in their belief in God and in His guidance and influence in this breakthrough which we hope will lead to Middle East peace. It made me realise that we Christians should not think that God only speaks and works through us. However, that does not shake my conviction that, in a unique way, God did speak through Jesus Christ when, as John expressed it, “The Word became flesh and dwelt among us”, the great truth which we celebrate at Christmas. So, although we Christians believe that God can only be fully known in and through Jesus, this is a good time to recognise that our non-Christian brothers and sisters can also be people of sincere good-will seeking the guidance of God in their own lives.